4 in 1 design! The versatility of this bag provides multiple carrying options. Use it as a messenger bag, sling bag, waist pack, or bike bag. Includes elastic straps in the back zippered pocket of the product to secure the bag to handle bars of a bicycle or grocery cart . Main compartment with hook and loop fastener. Front zippered pocket for storing small accessories or a mobile device (sized to fit an iPhone 7 plus). Interior organization includes a mesh pocket and keychain clip for securing keys . 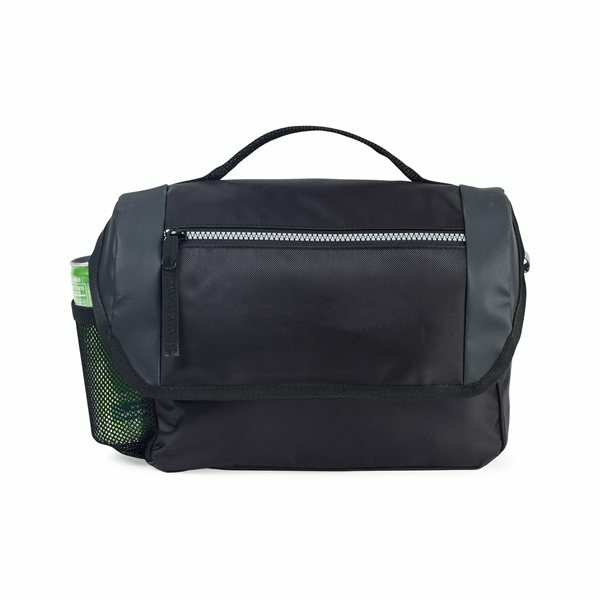 Unzip and pull out the adjustable strap from the side zipper pockets to wear the product as a messenger bag, sling bag, or waist pack and tuck away to conceal when not in use . Reflective accent on front for added safety. Fabric/Material: 210D Dobby Polyester, 600D Matte Polyester.